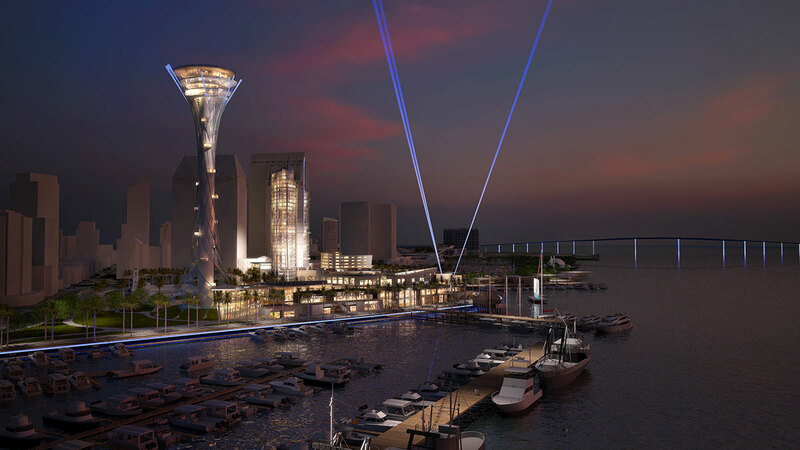 Seaport San Diego‘s plan for an iconic 500-foot spire, hotels, restaurants and shopping to replace Seaport Village won tentative backing Wednesday from the Port of San Diego. The port commissioners voted 6-1, with Chairman Marshall Merrifield opposed, to begin exclusive discussions with Seaport San Diego’s team, though the five other contenders could have a second shot at the project. The plan includes three hotels, nearly 400,000 square feet of retail and restaurant space, “The Spire” observation tower and an aquarium. Seaport San Diego is led by Protea Waterfront Development, whose principals are Yehudi “Gaf” Gaffen, founder of Gafcon construction, Jeff Jacobs, son of Qualcomm founder Irwin Jacobs, and construction executive Jeff Essakow. The international architectural firm BIG with offices in both Copenhagen and New York would lead the design. The port received 11 bids for the Seaport Village property and ranked six sufficiently complete to be considered. Seaport Village’s lease with the port expires in 2018. The Cubs Endorse Donald Trump?